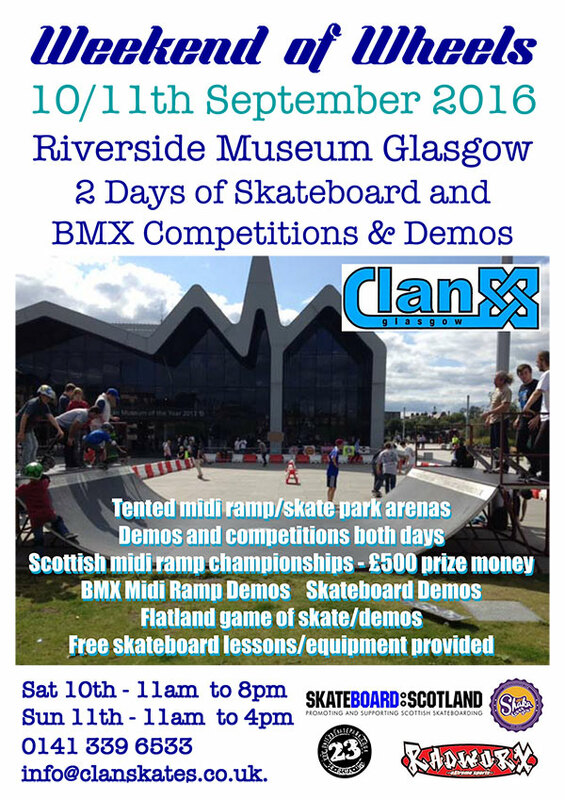 Clan Skates in Glasgow are organising a “Weekend of Wheels” on the 10th & 11th of September 2016 at Glasgow’s Riverside Museum / Transport Museum. It will be two days of skateboard and BMX competitions and demos with a £500 prize fund. There will be the Scottish midi-ramp champs and all in a big, dry tent! There will also be flatland game of skate comp / demos, BMX demos, free skateboard lessons with equipment provided. For more information get in touch with Clan Skates via info@clanskates.co.uk or 0141 339 6533.